MARCH: BOOK ONE shortlisted for Young Hoosier Book Award! News | MARCH: BOOK ONE shortlisted for Young Hoosier Book Award! 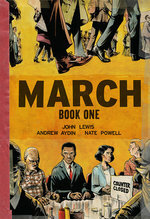 More congratulations are in order for Team March (Congressman John Lewis, Andrew Aydin, and Nate Powell). Last night at the Indiana Library Federation's annual conference, the Association of Indiana School Library Educators announced their shortlist of candidates for next year's prestigious Young Hoosier Book Award — and the most advanced category, Middle Grades, features March: Book One! Indiana's thousands of libraries will now spend the next year stocking up on the nominated titles, before the 2016-17 school year begins and students begin voting. 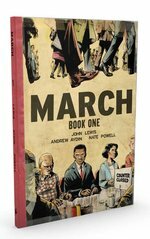 Meanwhile, students in Oklahoma are reading March in preparation to vote in the Sequoyah Book Awards, which have also nominated Book One for their 2016 list. 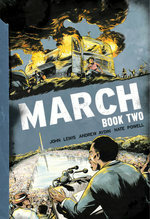 And as the year's end nears, March: Book Two has been declared one of the Best Books of 2015 by Publishers Weekly as well as The Washington Post, which declared "there is perhaps no more important modern book to be stocked in American school libraries... March is a powerful marriage of eloquent, stirring words and artful, gut-punching pictures."